As the HVAC Know It All wall of fame continues to grow, I wanted seek out an “HVAC Boss” worthy of prominence down the long and narrow hallway, where I continue to hang virtual plaques of HVAC greatness. I canvassed my Facebook groups, looking for the right person. Coincidentally that same afternoon, Joshua Thompson, My HVAC Hub moderator, wrote an impressive text about his boss and business owner in our admin/moderator text group. After reading Josh’s unsolicited testimonial, my gut told me that I found the “HVAC Boss” I was looking for. 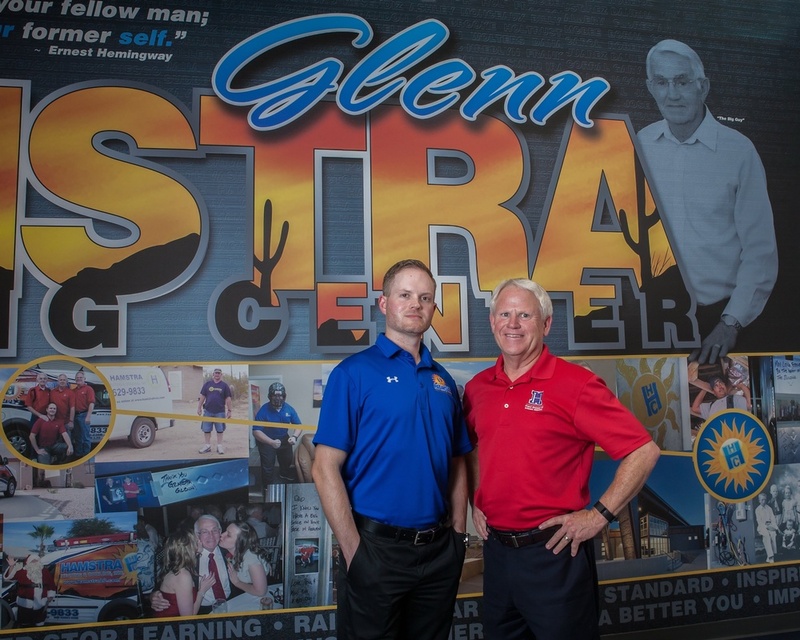 Wade Hamstra (gentleman on the left in the blue shirt from the headline image) is the Vice President of Hamstra Heating and Cooling Inc., in Tucson Arizona and is a third generation business owner, his father and grandfather started the company in 1987 and focused in on residential new construction. 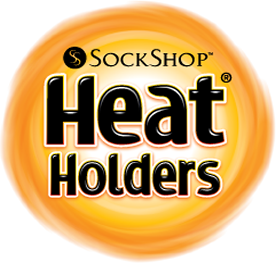 Wade has recently been handed over the reins to the company. Wade himself, started out in new construction and eventually earned his MBA in 2010. Wade is a visionary to say the least, before 2007- 2008, he and his father turned their focus towards the service and retrofit market in order to avoid a heavy collapse from a dried up economy. 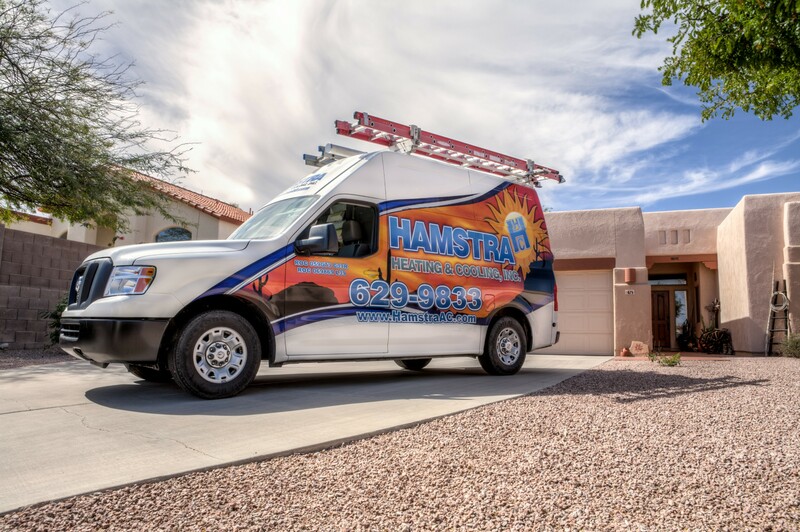 This proved to be the correct decision, Hamstra Heating and Cooling now draws multi million dollar revenues and only 5% of that is attributed to new construction. The company also carries approximately 70 employees. 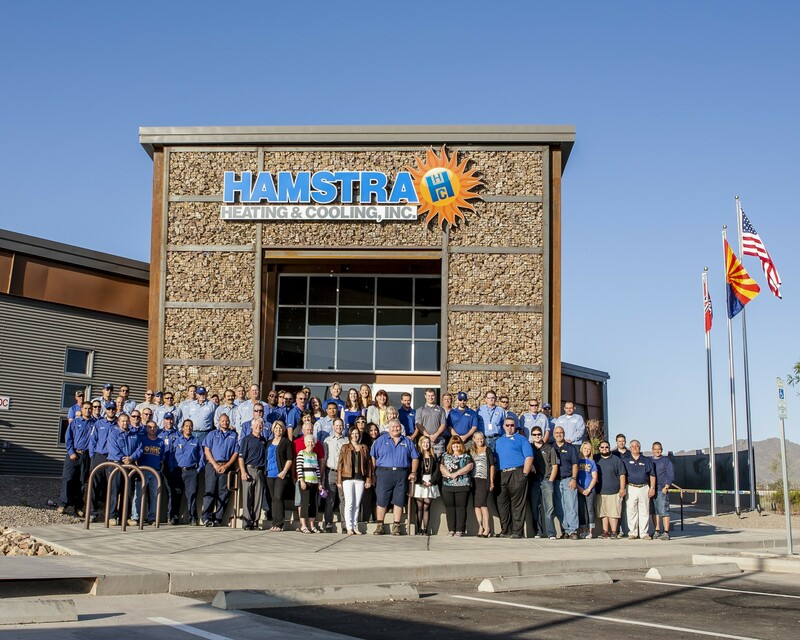 Employee wages at Hamstra are among the highest in the industry for both field and support staff. Fair wages are handed out for new service and install personnel, but with the right attitude and hard work, moving up the ladder happens fairly quick relative to other companies. A strong and heavy focus is put into keeping valuable staff around and promoting from within. A great example of this is that two of Hamstra’s very first hard working employees are still with the company, serving as field engineers laying out projects for install teams. Employees have access to bonus opportunities and health care plans, field staff receive uniforms, cell phones, iPads, a long list of tools and brand new fleet maintained vehicles. Wade has an open door policy, a custom that was passed down from his father and grandfather. He excepts constructive criticism of the company from his employees and keeps employee records of work anniversaries and birthdays, employees receive cards and gift certificates on these occasions...Unreal! His employees are also treated to very generous holiday bonuses. Training and continued education is key to success, Wade invests well over $200,000 annually to keep staff well trained. Service and installation teams receive weekly training on both technical and client support items. Only a great owner and boss can create and sustain this type of excellence. Hats off Wade, every HVAC Boss can take example of your approach and philosophy. You had some great mentors in your father and grandfather, I bet they are extremely proud of your accomplishments. From the outside looking in, it’s obvious you have this HVAC business thing figured out. But thanks to Josh, I’m not looking from the outside, I’m getting the meat and potatoes and I love what I see. Keep up the great work Wade!